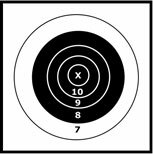 The number of shooting positions and targets that a particular range has available for a match will determine how many shooters can register for a match. For example, the Winnequah Gun Club, in Lodi, Wisconsin, has room for 22 shooting positions. Your range may have more or less than that number. You and your team will be assigned to a particular target / position for the duration of the match. Your target will be identified by a large number board that is located either in front of or behind your target. Typically the number board will be about as large or larger than the target (72” x 72”). The number boards are generally painted with white numbers on a black background, and black numbers on a white background in alternating sequence (i.e. white “1” on a black background, black “2” on a white background, etc…). The number boards help to ensure that you are aiming at your assigned target and not someone else’s. Shooters are assigned to either three-man or four-man teams for the two-day match at Lodi. If you want to shoot with your friends, at most matches you can generally designate on the match registration form that you would like to be teamed with a particular individual/s and list their names. Match organizers generally will do their best to honor your request. If you are coming to the match alone, tell the organizers of the match beforehand and they will do their best to assign you to a team with at least one or two experienced shooters who can offer you advice and help you through the match. Your “Shooter’s Package” (which you typically receive the morning of the match) will tell you which relay (1, 2, 3 or 4) you are assigned to shoot, and on which target (1 through X). If there are only 3 relays, the shooter assigned to Relay #1 will shoot first, while the shooter assigned to Relay # 2 spots and scores, and the shooter assigned to Relay # 3 pulls and marks targets in the pits. When the shooter from Relay #1 is finished, he spots for the shooter in Relay #2. When the shooter from Relay #2 is finished shooting, the shooter from Relay #1 goes to the pits and the shooter in the pits comes to the firing line for Relay #3. This alternating process continues until the match is completed. At some matches, the organizers may provide people to pull and mark targets in the pits. In that case, the shooters will not be required to rotate into and out of the pits. If there are 4 relays, the same type of shooter rotation takes place, except that 2 shooters will be in the pits at one time pulling and marking targets. A complete schedule of when each shooter is scheduled to shoot, score, or be in the pits is usually provided in your “Shooter’s Package” package prior to the start of the match to help avoid any confusion.